Some 1,400 people – more than twice the initial projection – gathered in Madrid for the regional conference for Spain, Portugal and the Canary Islands, making it one of the largest Baha’i events in the history of these three communities. As registrations mounted before the conference, organizers had to look for a bigger venue than originally planned, settling finally on a hotel located close to the international airport in the Spanish capital. At final count, there were more than 1,000 people from the Spanish peninsula, 140 from Portugal, and 135 from the Canary Islands. 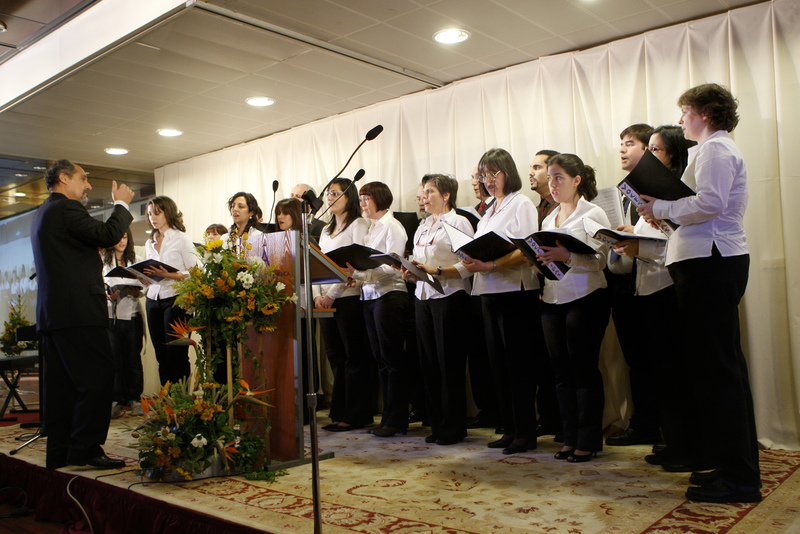 In addition, two Baha’is came from the principality of Andorra in the Pyrenees Mountains, and nine from the Spanish city of Melilla in North Africa. Other people came from Europe, the Americas, Africa, and Asia to share in the gathering. 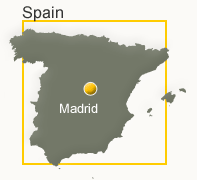 “Yesterday we missed our flight and had to buy new tickets, and we thought about whether it was worth coming to Madrid. Luckily we decided to come because being here is priceless,” summed up a woman named Minerva from Tenerife in the Canary Islands, off the western coast of Africa. The conference opened at 10 a.m. Saturday with prayers in the various languages of the Iberian peninsula. Attending the gathering as representatives of the Universal House of Justice were Mr. Juan Francisco Mora and Dr. Penelope Walker, both members of the International Teaching Centre. 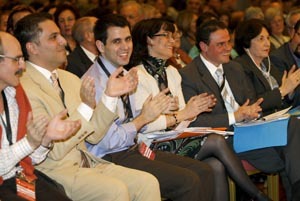 After the welcome by a member of the National Assembly of Spain came the reading of the message to the conference from the Universal House of Justice, which drew attention to the stated goal of establishing eight intensive programs of growth by April and another six in the two succeeding years. 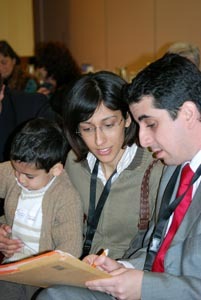 “It's like changing fuel – first we were growing slowly and now the Universal House Justice tells us that we must go faster, and we can do it because we have the institute process,” said Esther Medina of the Canary Islands, a new mother who attended the conference with her 5-month-old daughter. One of the presentations on the first day was a comprehensive briefing by Mr. Mora about the institute as an engine of growth – a session that clarified for many people what the institute is all about. 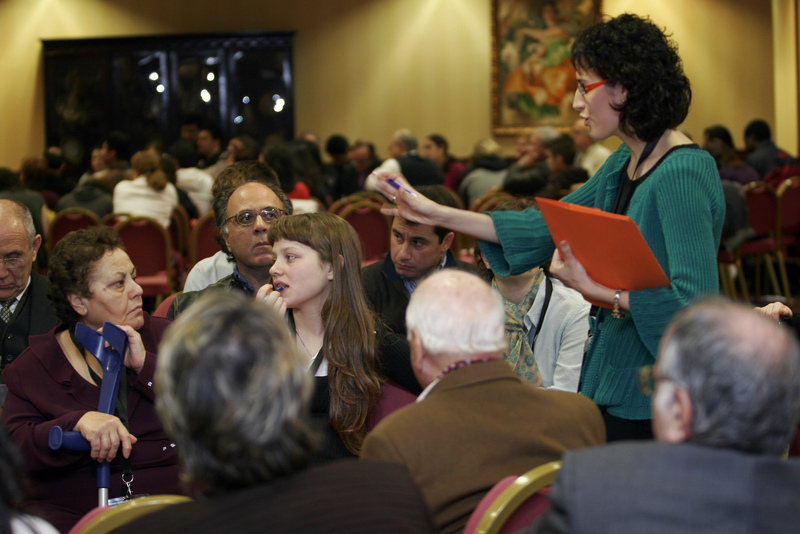 A number of people shared experiences during the plenary sessions. 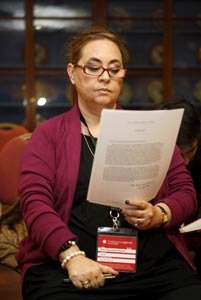 Sonia, of the Canary Islands, said she had participated in a study circle, using Book 1 of the Ruhi curriculum, with five women who were not Baha’is. “At the end of the book, all of them wanted to declare themselves Baha’is,” she said. Hundreds of photos of core activities that took place in recent months flooded the area of the stage at the beginning of the cultural program – visuals that were accompanied by the voice and live guitar of Arsham Evogli. 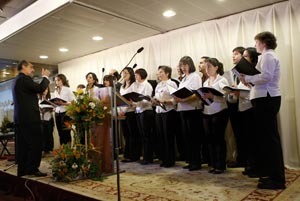 A quote from the Baha’i writings was shown, in the midst of a blend of flamenco dance and song. At the piano was musician Paco Suárez of Gypsy origin, accompanied by the flamenco voice of his wife Ana Montaño with Shango Dely on percussion and the dance of Kika Pulgarin. 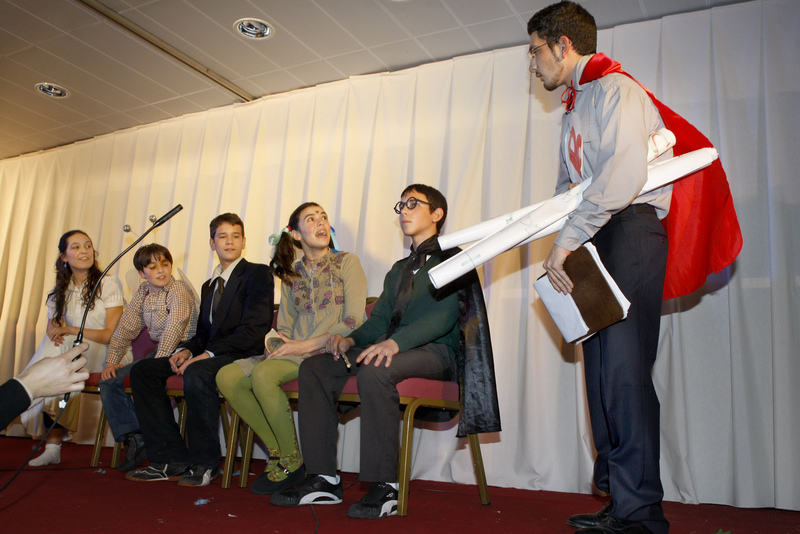 The audience was then ready to enjoy a play starring the junior youth – “The X-Nen,” a fun story showing the superpowers young Baha’is develop to change the world. The cultural program also included performances by a children's choir and a musical group from Spain, Portugal and the Canaries that performed songs composed especially for the occasion and involving the participation of the audience. The second day opened with an inspiring devotional program in Portuguese and Spanish, followed by an address by Mrs. Zoraida García, a member of the Continental Board of Counselors. Then came workshops for consulting about activities in specific communities. Participants were divided into 18 groups to create a plan of action for their region and consult on how each person can help. The results, summarized afterwards by Mr. Mora, showed hundreds of commitments, including plans by individuals to initiate nearly 500 new study circles, devotionals, and classes or activities for children and junior youth. Twelve people offered to move to new areas to help with core activities and establish intensive programs of growth. 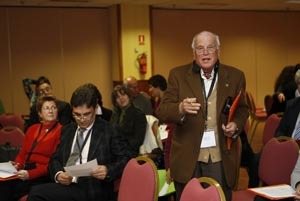 A hotel located near the international airport in Madrid served as the conference site. 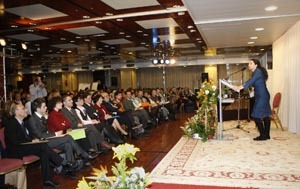 A participant reads the message from the Universal House of Justice addressed to the conference. Workshop sessions give a chance for closer reflection of the letters from the House of Justice. 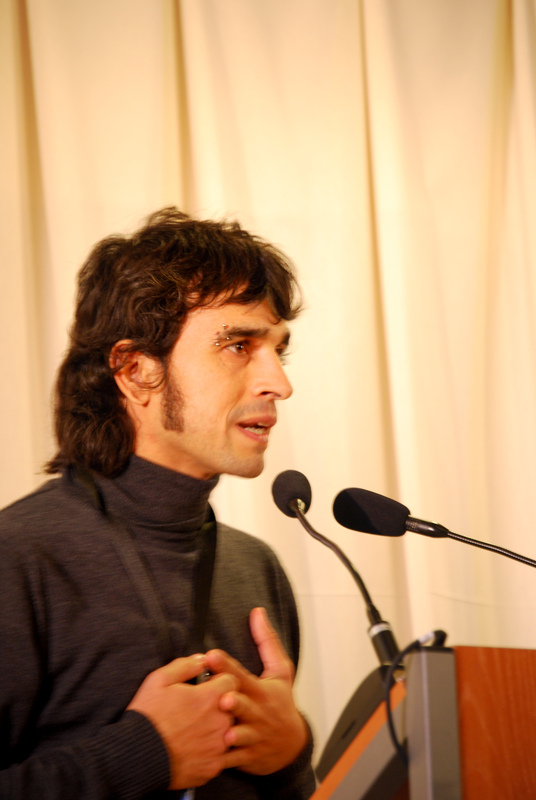 José Moreno of Marbella, Spain, tells the conference about some of the core activities in his community. Music has been a part of all the conferences. 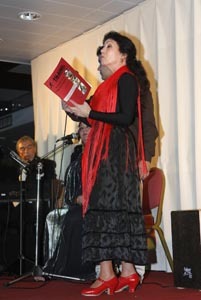 Kika Pulgarin offers an interpretation in dance of a passage from one of the institute books. Children had their time in the spotlight, too. Attendance was about 1,400 people, making the conference one of the largest Baha’i events ever held in Spain or Portugal. A workshop facilitator takes notes during a breakout session on Sunday. Many participants commented that their understanding of the institute process became much clearer during the Saturday sessions. 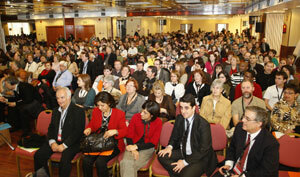 Hundreds of people were quickly and efficiently organized into workshop groups. Final registration showed more than 1,000 people from the Spanish peninsula, 140 from Portugal, and 135 from the Canary Islands.. The Egea family of Barcelona works on a personal planning sheet. 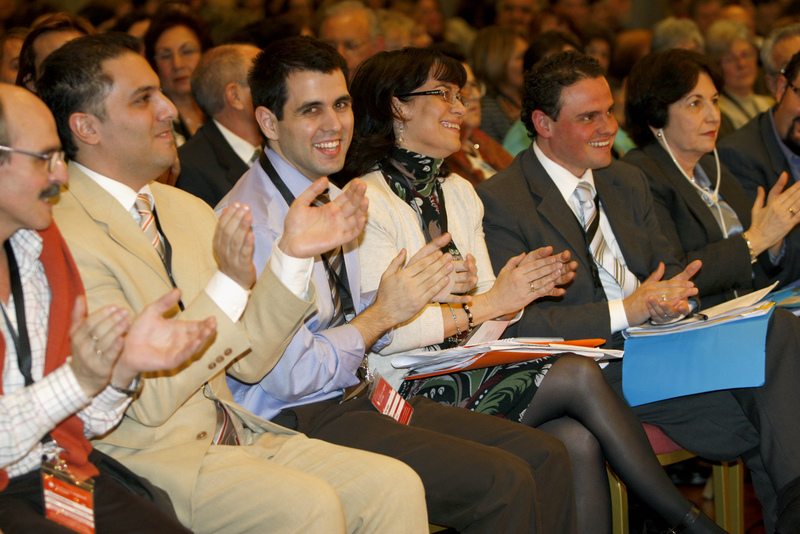 Representatives of the Universal House of Justice, at right, are joined by members of the National Assembly of Spain, a member of the Continental Board of Counselors, and a member of the Auxiliary Board.